While I try to keep much of my Offbeat Eating, well, “offbeat”, sometimes it’s good to go back to old favorites. And since a trip of our up to the RAF London museum had use out in the northwestern suburbs of London, that meant a side shopping trip for my brother to pick up bagels. You see, growing up in the Kaszeta household, one of the more holy culinary traditions is that Sunday mornings were typically celebrated with toasted bagels. So when my brother moved off to London, he found himself with the occasional craving for a good toasted bagel. Which actually is a bit of a challenge in London. Sure, those that are somewhat aware of the culinary scene in London are already going, “But there is Beigel Bake on Brick Lane!”, but, just like the spelling of “beigel” differs from “bagel”, the product itself varies, mostly due to the different culinary adventures the baked good has had along its various Yiddish voyages to New York, Montreal, or London. 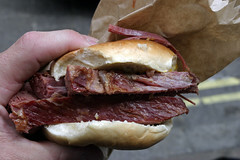 Don’t get me wrong, I rather like a good salt beef beigel from Beigel Bake, loaded up with delicious beef and hot English mustard. But the beigel itself is a bit more bready and less chewy than my expectations for a “bagel”. That’s where Golders Green comes in. Golders Green is a London suburb that pretty much developed in the late 1900s, and shortly thereafter became one of the more predominant Jewish neighborhoods of London. And, unlike Brick Lane, retains much of that character to this day, although it’s also interestingly more than a bit of an Islamic (Halal butchers line the streets as well, and more than a few storefronts share both Hebrew and Arabic signage) and Turkish enclave as well. 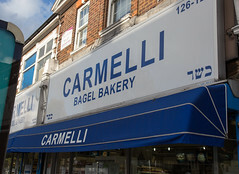 But due to this Jewish population, Golders Green has at least four bagel bakeries I’m aware of: Carmelli, Daniels, M&D Grodzinski, and Paradise Bakery. But the word on the street, and that confirmed by my brother, is that Carmelli has the best New York style bagels. So armed with a few pound notes from my brother, we set off for a side trip to Golders Green for some bagels. As far as the bakery itself goes? Well, Carmelli is basically what, in several other towns I’ve been in (Philly, New York City…) a fairly standard Jewish deli. The highlight here is bagels, of your standard varieties (well, at least before Einsteins and the like got everyone eating all sorts of abominations like gingerbread and chocolate chip bagels), as well challah, tarts, babka, and all sorts of other delicious treats. But we came for bagels, and soon found ourselves loaded up with an implausibly large number of bagels of the plain and sesame seed variety (enough to fill up my brother’s freezer, which I still find implausibly small by US standards). So, how were the bagels? 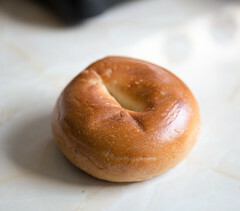 To me, the real standard that separates a good bagel from a poor bagel, or even “bagel-like bread”, is the chew. There’s a combination of crust and chewy interior texture that’s almost impossible to achieve with a proper boil-and-bake method, and Carmelli’s has this down pat. A nice glossy texture encloses a firm, chewy, and almost springy interior that’s just bursting with good bagel doughiness. Will it replace some of my favorites, like a good honest Ess-a-bagel from NYC, or a Fairmount Bagel from Montreal? No. But it’s still a quality bagel, and quite frankly, Carmelli makes a better bagel than the vast majority of American bakeries. It’s certaintly top tier. So yes, if you are an expatriate looking for a good American-style bagel, it may well indeed be worth the trek up to Golders Green. Well, the 2012 round of travels continues, this time with a trip to Iceland (for pleasure, it’s been on our to-do list for years). But before I could start reviewing Icelandic food joints, we had to actually get to Iceland. Which means a plane flight. Which means airports. Which often means airport food. As I’ve commented before, airport food is generally a dismal experience. Airport dining options are generally limited, overpriced, poor quality, and, bizarrely, often seemingly unaware of the fact that they are located in an airport and their customers have planes to catch (Yes, Todd English’s Bonfire at Logan, I’m still pissed at you…). But we again found ourselves with a red-eye flight across the Atlantic, and our bus schedule leaving us some time to kill in Terminal E before our flight. Not having quite enough time to take the Silver Line over to South Station, we had to find some dinner at the airport. While I’ve had some decent meals at the restaurant located right outside security in Terminal E, I decided that this time we’d mix it up, and walk over to Terminal C (as an aside, it’s an interesting walk, since you go through the remnants of Terminal D, which has been subsumed by Terminals C and E) to check out the Logan Airport edition of the Legal Sea Foods chain (this is their “Legal Sea Foods” location in Terminal C, they also have a “Legal C Bar” in Terminal B, and “Legal Test Kitchen” in Terminal A)….